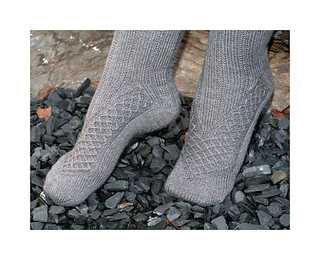 From the toe emerges a cable pattern, broadening to the whole instep. At the gusset the cable design splits up, giving way for a different stitch pattern. 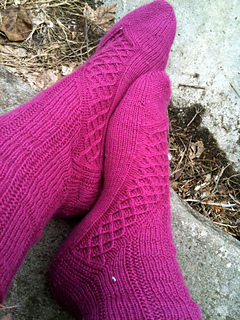 Those cables give some interest on the foot part, but are entirely doable by a not-so-experienced knitter. 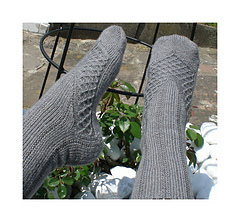 The leg part contains small seed stitch ribs, which break that sometimes boring stockinette stitch. 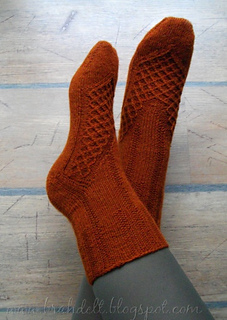 The English version is still available on Knitty.com. For easier usability, I added a file with all the charts so you can print them at once. The German translation is now available! Die deutsche Übersetzung ist nun als Download verfügbar!